A full day experience by comfortable minivan that starts with the visit of an authentic Sicilian farm, cheese tasting, traditional food tasting - oil, cheese, sun dried tomatoes - and a typical Sicilian lunch, followed by the visit of a local winery and wine tasting, ended by a sunset walk in an amazing fishermen village. This private day-trip with local tour guide will give our guest the opportunity to live for one day with the farmers and the wine makers, discovering some of the most genuine food gem of our land and enjoying an authentic experience in the beauty countryside of south-east coast. Starting from Syracuse, a sightseeing drive will lead you along the ocean side, the hills and the vineyards on our confortable minivan, towards the Noto valley, for approximately one hour. Then, you’ll be welcomed by the Farmer and his family in their ancient Sicilian farm, with a first tasting of some of their delicious products in a very relaxing and friendly atmosphere. A walk around the farm, surrounded by the scent of almond and lemon trees, will give you the opportunity to see the flock of sheep, where every day they get the milk, and to admire the elegance of the almond trees, where the authentic and prizes winner Mandorla di Noto comes from. During the walk you will also learn how to work the almonds to create the famous Sicilian almond milk. After the walk, The Farmer will offer you a real demonstration of how to work diligently with sheep’s milk to create the delicious Ricotta cheese, fresh mozzarella and other typical Sicilian cheeses, with the warm breeze rolling in from the Mediterranean Sea into their rustic kitchen. You will definitely enjoy the best cheese-making demonstrations in Sicily. From the first drop of milk to the delicious final products. All these products will be the base for the typical Sicilian lunch, where the friendly feeling of a small and intimate group of food lovers will make the experience unique. 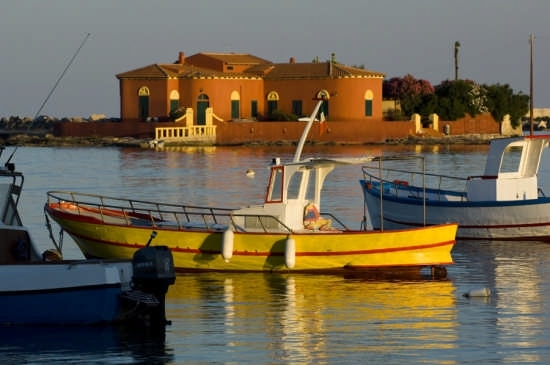 After lunch, Your Driver will lead you to the amazing Marzamemi, a fisherman village that has, recently, become an incredible spot for people who wants to enjoy a nice walk in the old town, surrounded by the ocean and the breeze. The village extend around the harbour and it is characterized by narrow streets and little stone houses with roof tiles, while a large square is the center of the town. Approximately at 3pm, our English speaking driver will take you through the breathtaking countryside, to discover this wonderful area of Sicily, where you can find a landscape typical of Tuscany, with hills, olive groves and the Nero d’Avola vineyards, a unique experience to enjoy driving along scenic and silent country roads for approximately 45 minutes, and having fantastic photo opportunities. The excursion continues with a two hours visit of one vineyard and their cellars and the wine tasting, followed by traditional food tasting - oil, cheese, sun dried tomatoes – where you will learn the different characteristics of our local wines, discovering the history and the taste of some Sicilian wines that are beginning to be sought after all over the world. You will also learn how to match wine perfectly with our impressive Sicilian cuisine. Around 6pm the Day will drive to finish driving back to your Hotel.